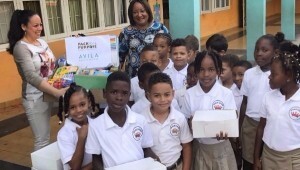 WILLEMSTAD - Avila Beach Hotel wished Oranjeschool a happy start of the new school year with 15 computer screens, 200 donuts and a huge amount of school supplies brought by their hotel guests with the PackforaPurpose.org project during the summer break. The Avila Beach Hotel became a member of Pack for a Purpose which encourages tourists to bring supplies useful, in this case for the nearby located Oranje school. It's already catching on because guests often bring a package with school supplies. With initiatives such as Pack for a Purpose, the Avila Beach Hotel wants to contribute to the local community.